Our tube mount transmitter / DIN-rail receiver wireless interface solutions are available to provide both one way and two way communication eliminating expensive hard wiring hardware and installation costs. 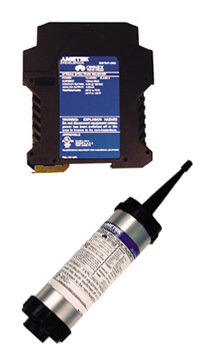 The 28670XX-DRX Series are unidirectional wireless systems that comprise a transmitter and a receiver. This Drexelbrook transmitter accommodates two digital signals in the range from 5 to 30 V AC/DC or 100 to 240 V AC and one analog current signal (4-20 mA). These signals are available for further processing at the receiver in the form of two relay contacts and one 4-20 mA current output. In addition, a third relay in the receiver diagnoses the status of the wireless connection (RF link).